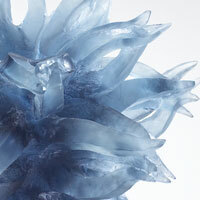 Anja Isphording – Glass Artist…How Does She Do It? A friend of mine just turned me on to a fantastic glass artist, Anja Ishording, that specializes in casting and all we can say is, “How does she do it?” You may ask that same question…or just look and enjoy. Her work has a sea form quality to it. The pieces look like they could live at a coral reef or on the bottom of the ocean. Maybe you saw it in a garden somewhere. This stuff is gorgeous. Look at the work. Learn about her. Enjoy! Thank you, I needed that! These pieces are amazing, and so beautiful; like you I’d sure like to see the process.